The year began with an end — an end to “challenging times” for former Thunder Bay Police Chief J.P. Levesque. In January a judge acquitted Levesque on criminal charges for his involvement with a police investigation of former city mayor Keith Hobbs. The Thunder Bay Police Services Board saw the decision as a win. “We’re all feeling really good going forward for the reputation of the city and the reputation of the police.” said former board chair Jackie Dojack. But with 11 months left in the year, the police force’s troubles were far from over. Jan. 28 marked the one year anniversary of an incident that rattled many, when 34-year-old Barbara Kentner was hit in the stomach by a trailer hitch thrown from a passing vehicle. The young mother succumbed to the injury months later. Community members came together to remember her. “I don’t want anyone to forget what happened to her,” said Nichole Langdon, who helped organize a vigil for Kentner. Brayden Bushby faces second-degree murder charges for Kentners’s death. In March the Office of the Independent Police Review Director (OIPRD) found two Thunder Bay police investigators guilty of disorderly conduct and neglect of duty for their work in the death investigation of Stacy Debungee. It was Debungee’s case that prompted the OIPRD to review 37 more police investigations, most of them involving Indigenous people. It was a good indication of what was yet to come. The police board did not fire the chief, but Levesque quietly announced his retirement shortly thereafter. 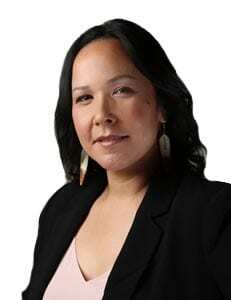 Two years ago Angelique Eaglewoman made history when she was appointed the first Indigenous dean of law in Canada. She then made headlines again in 2018 after resigning over alleged systemic discrimination at the hands of her employer, Lakehead University. Eaglewoman filed a $2.6 million lawsuit against the institution, which is still before the courts. In the midst of a heavy year, jingle dress dancers united to share cultural teachings with students. But it was much more than a lesson. “There’s been a lot of, like a negative atmosphere around the rivers and the seven students inquest and I was beginning to see it was all negative stuff, so I wanted to bring some positivity and some culture and just some pride and identity,” said Cheryl Suggashie, one of the dancers and an organizer of the event. Then, in December, the OIPRD’s report “Broken Trust” was released. The two-year investigation into the TBPS confirmed what many Indigenous people had been saying all along. “Overall I found that systemic racism exists in Thunder Bay Police Service at an institutional level,” OIPRD Director Gerry McNeilly announced. Two days later the Thunder Bay police were further disgraced with the release of Senator Murray Sinclair’s report for the Ontario Civilian Police Commission. That report echoed its predecessor’s findings of overt and systemic racism. It also recommended a solution — to dissolve the board and replace it with a single administrator. “We acknowledge unequivocally that systemic racism exists both in the service and the board,” said Tom Lockwood, the police board’s new administrator. Among the chaos in Thunder Bay, some milestones were reached. Sylvie Hauth was named the city’s first female police chief, and Celina Reitberger was appointed the first Indigenous chair of the police board. In January APTN will continue bringing you coverage from Ontario’s far north. On Jan. 15 we are slated to find out if Brayden Bushby will stand trial for the death of Kentner.